Beautiful Monterey, CA is one of Grays Harbor Historical Seaport’s favorite coast communites. In addition to the tremendous local support we receive there, Monterey is a city rich with history. As the original capital of Spanish colonial California, Monterey’s seafaring heritage dates back to the days of the orginal Lady Washington. That is why for the second year in a row, Lady Washington will be taking part in a historic reenactment of the historic Monterey Presidio. This November marks the 200th anniversary of one of Spanish California’s most dramatic events. 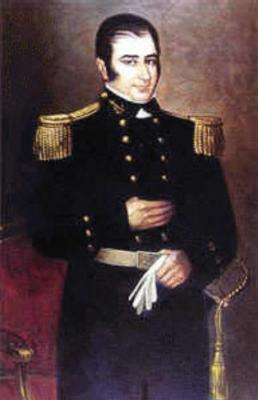 On Nov. 20th,1818, the Argentine privateer Hippolyte Bouchard led an attack on Monterey, bombarding the poorly protected Presidio and capturing the city. 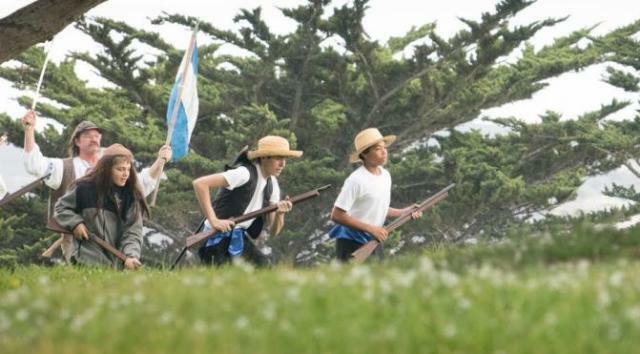 For 6 days, the Argentine flag flew over Monterey, essentially claiming Spanish North America as the territory of Bouchard and the Argentinians. When reinforcements did not arrive to defend the fort, Bouchard and his men decided to leave the abandoned town behind and continue plundering Spanish villages in Mexico. The event, though short in its impact, marked the only land-sea battle of Latin America’s wars against Spain for independence. This year, visitors can watch a reenactment of this epic event from the shore as cannons ring and sabres clash in honor of the bicentennial of Bouchard’s invasion. Lady Washington will play the roll of Bouchard’s ship Santa Rosa. Viewers will feel as if you’ve stepped back in time when Lady Washington unloads her deck guns upon the Spanish soldiers on the beach, culminating with the raising of the Argentine flag over the customs house in front of Lower Presidio Park. Monterey Museum and Cultural Arts Commission is sponsoring a number of festivities related to this anniversary on Sat. Nov. 17th. From 10:00 AM – 11:30 AM. Here visitors can also learn more about the history of Bouchard with presentations at MIIS’ Irvine Auditorium. The reenactment itself will take place on Sat. Nov 17th from 1:00 PM – 2:30 PM in front of the Custom House near Old Fisherman’s Wharf. After the event from 3:00 PM – 5:30 PM, also at MIIS’ Irvine Auditorium, historians will give talks on the battle featuring entries from some of the soldiers’ diaries. All events are free! For those seeking a trip aboard Lady Washington, the vessel will be staying in Monterey at Old Fisherman’s Wharf dock #1 between Nov. 8th and Nov. 25th. Lady Washington will host open tours by $5 donation from 4:00 PM – 5:00 PM Tuesday – Friday and from 10:00 AM – 1:00 PM on weekends. You won’t want to miss this celebration of Monterey’s historic past! For more information on the reenactment, email battleofmonterey@gmail.com or search “Battle of Monterey 200th Anniversary” on Facebook. For more information about Lady Washington and her sails and tours, visit historicalseaport.org.